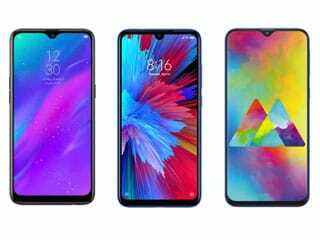 The Samsung Galaxy M20 is Samsung's attempt to take on Xiaomi, Realme, Honor, and Asus in the fiercely competitive low-cost market. It offers specifications that are good enough to match these rivals, plus a very modern all-screen look with a waterdrop-style notch. The Exynos 7904 processor was designed specifically for the value segment in India, and works quite well. The display is large and crisp, and battery life is very good. However, the cameras are just mediocre, and Samsung's UI is riddled with spammy ads and notifications. The Galaxy M20 will appeal to Samsung fans who are looking for great value. The Phone is Ecstatic.The touch pad is bright and looks great.The processor works quick and is smooth. The front and rear camera are both great and the images clicked by them look surreal.The Low light images clicked by this mobile phone are great and better than which I have seen in other mobile phones.The mobile Phone is quite light weight and is easy to carry. The design of the phone is fabulous, especially the notch.The front flash being in screen is something great.The battery life is something which every mobile phone user wishes for. The user interface is damn good and is quick to response .The dual SIM feature is works great for me,also the memory can be expanded upto 512 MB which is something I haven't seen in this segment.The storage capacity makes it easy for me to store all my important data. The youth would really love this phone. The portrait mode is really awesome. Big data games like PUBG and PES are work really well.I think this the best phone in this price range and I am glad that I choose this mobile phone.The Packaging of the mobile phone is great and the quick charge specification is great.The 15W charger works nicely .I would like to recommend this phone to as many people as possible because , this is something superliciously great in this segment. The best thing it has infinity display with v of 6.3 inch. The phone is easy to hold as its light weight. It has a fingerprint which people like me wants the most now a days. This phone is in trend and people are eagerly waiting to buy this phone as I saw 3 of my classmates eagerly waiting for the sale day. It has a good processor system. Samsung galaxy m20 gives us the earphones plus ctype charger. It is a very different and unique from other phones. Samsung galaxy m20 gives us the two volours ocean blue amd charcoal black. It gives us the good brightness. It has very colourful display. It is perfect phone for gaming becoz it has a good battery power. It is a perfect choice to take it for travelling. It gives us the best price to purchase. It is very impressive phone.it is Exynos 7904 powers. It has good sound quality. Iam very happy to purchase this phone. It is a perfect choice to buy a phone for everyone.. Buy samsung galaxy m20 phone. Keep it up.. Samsung galaxy m20 is the best phone. SamsungM20 is the most attractive product It is a battery beast The 5000mah does the work.. It charges very fast.. It gives the wide mode feature and also live focus feature in the camera , i can cover all my friends in one screen. I also have the special feature of stickers in selfie camera . I also like the wide screen i am able to see the full movie on wide screen . It is of 6.3 inch. I would like to recommend all this product to all. 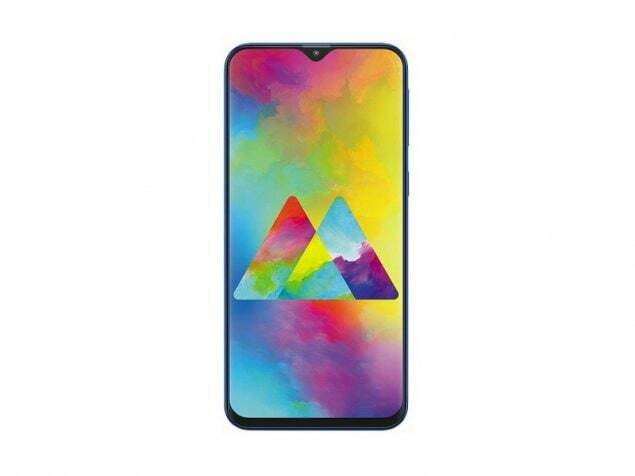 Samsung Galaxy M20 smartphone was launched in January 2019. The phone comes with a 6.30-inch touchscreen display with a resolution of 1080x2340 pixels and an aspect ratio of 19.5:9. Samsung Galaxy M20 is powered by a 1.6GHz octa-core Samsung Exynos 7904 processor that features 2 cores clocked at 1.8GHz and 6 cores clocked at 1.6GHz. It comes with 3GB of RAM. The Samsung Galaxy M20 runs Android 8.1 Oreo and is powered by a 5,000mAh non-removable battery. As far as the cameras are concerned, the Samsung Galaxy M20 on the rear packs a 13-megapixel primary camera with an f/1.9 aperture and a second 5-megapixel camera with an f/2.2 aperture. The rear camera setup has autofocus. It sports a 8-megapixel camera on the front for selfies, with an f/2.0 aperture. The Samsung Galaxy M20 runs Samsung Experience 9.5 UX based on Android 8.1 Oreo and packs 32GB of inbuilt storage that can be expanded via microSD card (up to 512GB) with a dedicated slot. The Samsung Galaxy M20 is a dual-SIM (GSM and GSM) smartphone that accepts Nano-SIM and Nano-SIM cards. Connectivity options on the Samsung Galaxy M20 include 802.11 b/g/n, GPS, USB Type-C, 3G, and 4G (with support for Band 40 used by some LTE networks in India). Sensors on the phone include accelerometer, proximity sensor, and fingerprint sensor. The Samsung Galaxy M20 supports face unlock. It was launched in Charcoal Black and Ocean Blue colours. 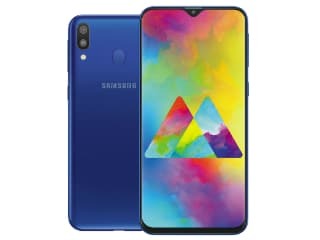 As of 19th April 2019, Samsung Galaxy M20 price in India starts at Rs. 10,990.